When EastGroup Properties Inc. broke ground on the first phase of its Einsenhauer Point industrial development this year, shovels hit the dirt on a completely speculative basis. 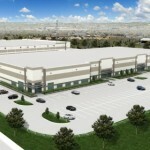 Roughly 10 months and two buildings later, the real estate investment trust is adding even more as a result of accelerating demand for industrial space along the I-35 corridor. Phase two of Eisenhauer Point — at the interstate’s intersection with Eisenhauer Road — is slated to include two buildings encompassing nearly 156,000 square feet, with construction expected to be finished in spring 2017. Eisenhauer’s first phase spans a bit more than 16 acres and includes two multitenant office-warehouse buildings. One is a 133,000-square-foot cross dock, and the other is a 68,000-square-foot rear-loading facility. Tenants at Eisenhauer include Halfen USA Inc., Xylem, Crane Payment Innovations, Fresenius Medical Care and Stanley Steemer.